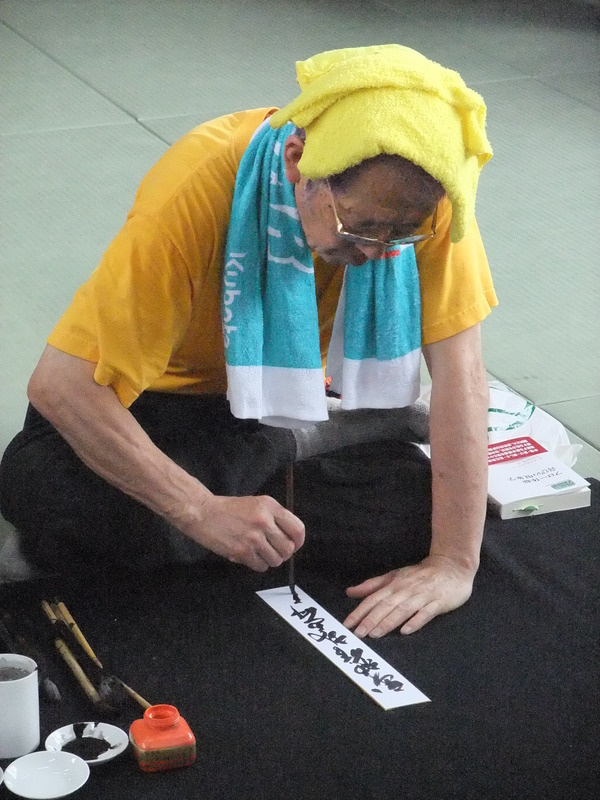 Noguchi sensei gave a koto class this morning and insisted again on the importance of training the basics. We reviewed his magic gogyô and the kihon happô. Over the past twenty years in Japan I have seen these “basic movements” many times with various shihan but it is always a pleasure to study them from a different perspective. There is so much to learn in these two series that they should suffice to fight efficiently. Everything we do is using parts of these fundamental technique. The gogyô no kata and the kihon happô are never studied enough and Noguchi sensei insisted once again on the importance of the tenchijin ryaku no maki (天地人), the set of fundamental techniques of the bujinkan. Personally I learn a lot each time I have the chance to study them. They are always the same but always different. I will start the study of these “new” series with those attending to the summer camp. After this nice beginning we did many techniques of the koto ryû getting the knack, and adding jumps and a lot of jûji aruki (yoko aruki). I love Noguchi sensei’s classes for their richness and because each time I do these techniques (hida, kompi, kappi etc) I understand new things within them. 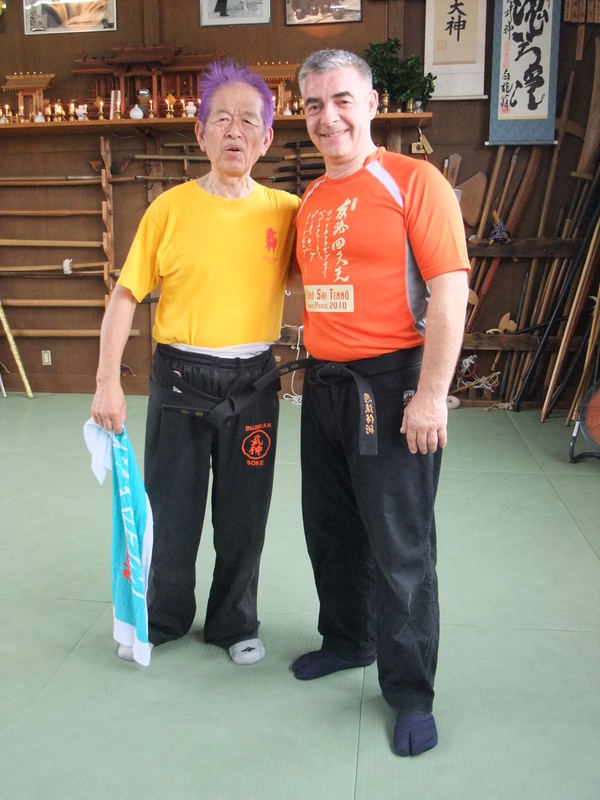 Hatsumi sensei being late this morning and Noguchi sensei having other obligations, he asked me to begin the class. It is always strange to switch from the role of the student to the role of the teacher at the hombu dôjô. 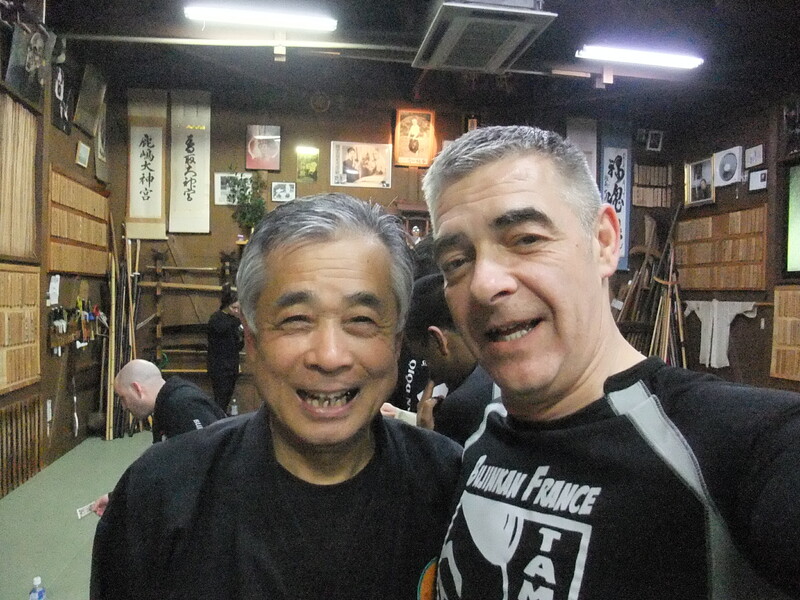 It is also even stranger to see the shihan having the same difficulties repeating my techniques that I have when I attend their classes! Sensei arrived and the class began after the rei with another technique both in taijutsu, tachi, and bô. I was asked by sensei to demonstrate two other techniques putting the nagare (流れ) into action in multiple directions at the same time and we did many henka (変化) with and without weapons around these. As always sensei’s understanding was amazing. From today’s class I can point out two important details from sôke’s teaching. The first point is that when you control your opponent softly i.e. with no muscular force, he is not be able to react properly. Strength generates natural body reactions or reflexes from uke that are often unpredictable or hard to block or absorb. Therefore we must train in such a soft way that uke is not able to react or understand what we are doing; and he gets tense and chaotic in his reactions and loses his balance by his own uncontrolled reactions. An image we can use so that you get it is when you were a kid holding an apparently very heavy box (empty in reality) and passing to a friend with a lot of apparent efforts. Your friend takes the box with unnecessary force and the box flies into the air. This is the kind of fake reaction you must get uke to do in the fight. Strength calls for stength in return but softness will off balance uke. Show always a kokoro gamae (心構え) different from your tai gamae (体構え). The other interesting point was the manner how sensei is taking your balance (still softly) in three axis at the same time making ukemi nearly impossible for you. you litterally explode where you are and fall heavily. Like the ikebana (生花) structure based upon the ten chi jin (天地人) those three axis are one and no action precedes the other. A flower arrangement always symbolizes the ten – the mountain, the chi – the paddy field, and the jin the stream running down the slope. The up vertical – ten is linked to the down vertical – chi through the horizontal – jin. In today’s technique sensei was accompanying uke’s fist attack on the same line, pulling it lightly steping backward (chi), pushing the elbow horizontally with the other hand in a sort of musô dori (jin), and stepping lightly forward with the other leg to control the front leg of uke (ten). In this posture uke is pulled forward, backward andto the side. No ukemi is possible. No strength, no strong grab, only footwork. We applied also the same kind of movements with tachi kumiuchi and bô jutsu. The good thing about visiting sensei in August is that we are not so many people in the dôjô and this is always a good opportunity for sensei to teach and for us to train the long weapons. The beauty of long weapons resides in the understanding of the angles and the management of longer distances. But today distance was not the point was not the work on distance as we mainly used the gyokko ryû no bô (held at the mid section and not at the tip). It was a good relaxed class. Very awesome, I wish one day I can be there. For today though, I feel just how fortunate it is that there are many Shihan like you that are and share their educational experiences; and that the Bujinkan is a strong art that will continue inspiring me in my life training. 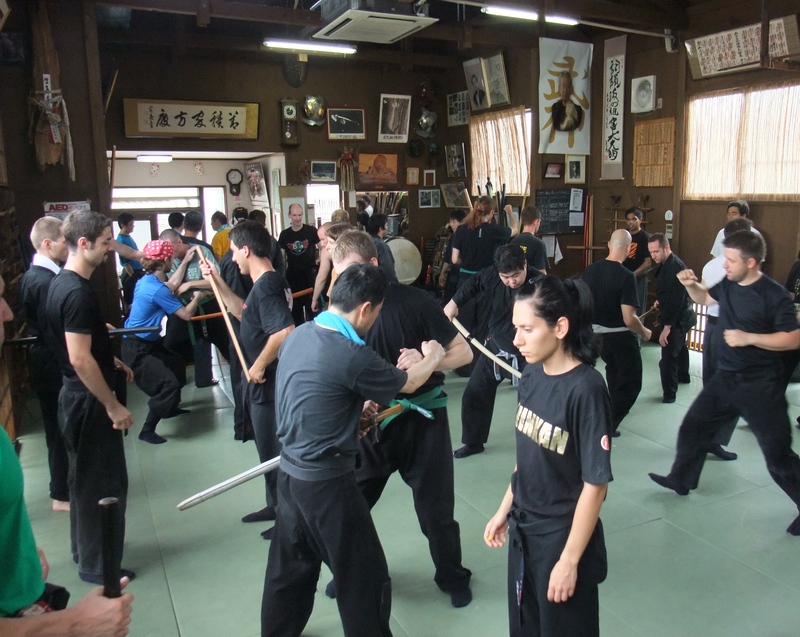 This year for me will make twenty years of Bujinkan Ninpo. Thank You Soke, so far away, but so close in my Budo heart everyday. Thank you for sharing this valuable information, Shihan. I see an interesting road ahead for Us as practitioners learning from your experiences with our Master. but also challenging from my perspective/ level or maybe even at times… dialemma. So I can get the question in my mind… Can I get “formless” too fast? Or said in another way… Is it possible with an age in midforties, that cannot do the flexes as the young students of midtwenties and thirties to develop the more “relaxed” taijutsu that comes of age and Knowledge and Life experience? I am having a small dojo and want of course my student to have the best info avalible – also meaning Me doing my best to be a good Guide in our Tradition. I’ve learnt a lot from this trip and I wish I could go again very soon.